Look at the face on the wall. This photo is one in a series. Photo by Chip Thomas. This was the image that captured my imagination and lead me to Chip Thomas’ doorstep to spend a week in Diné Bikeyah, or Navajoland, in the most northeastern part of Arizona, where scale is unquantifiable. 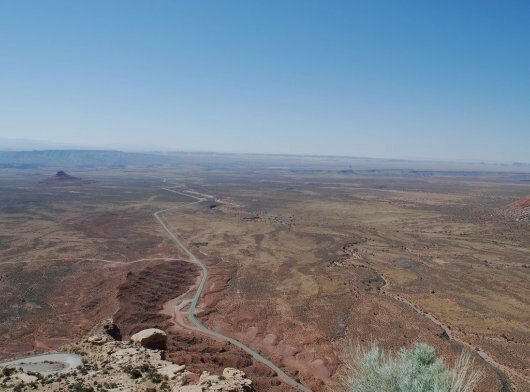 Even with a population of ~170,000 Navajo people on 26,000 square miles, the land is vast and its people dispersed. Chip has spent the last two years pasting giant photos of the people he knows on the walls of buildings throughout the reservation. The images range in size — some as big as 12 by 24 feet, filling up the better portion of a two-story building. The French street artist JR, who was awarded a TED prize, asked whether art could change the world. I see art as a means to invite people to engage in a way they otherwise might not. Art can serve as a welcome mat and a window into the happenings of a community. It can spark conversations and engagements that might not otherwise exist, change the physical environment, and raise awareness of the faces and activities in a community. With those ideas in mind, I headed south to explore the unexpected mix of street art in the vast Arizona desert. I wanted to experience how photographs pasted on houses, trading posts, and water towers impacted the people around them. I found out that the act of pasting larger-than-life photos is a magnet for people. While I watched a face going up, old and young stopped in awe to watch the process. Conversation sparked. How long has this been happening? How much does it cost? Who is the face? Would you do the same at my house? What is the paste made of? Can I help? Where are you from? I remember the story of a newspaper in Iowa that was, per capita, the best-selling paper in the country. People bought the paper to see the stories of their neighbors, their families, and their friends. The man who ran the newspaper had figured out the more people he could feature in his paper, the more papers he’d sell. While there’s probably a better analogy, I see art, like that of Chip’s, as creating a similar environment -– a desire to understand and get to know the people in your community. I liken it to the photos that families often hang on their walls, documenting their children’s progression from kindergarten to senior year of high school. What if we did the same with communities and public space? Instead of billboards and advertisements of random people walking by, what if we used public space as a way to celebrate the inhabitants of a community? Could we create a physical space equivalent of the best-selling Iowa newspaper? It’d become an invitation to get to know the faces of the people in a community, like our parents’ living room walls. What I’m aiming to learn more about in the next year is what’s possible when you integrate community storytelling and use similar installation art as a forum to share those stories. Is a community strengthened by the conversations and neutral spaces created around public art? This is the first of a series by Kate Mytty who recently learned to mix wheat paste under Chip Thomas’ guidance in Arizona. You can also find Kate over at the MIT Global Challenge. Amazing! I love it. Thank you for sharing such an innovative and inspiring way to deepen community ties and pride. thank you kindly, Dr. Hynd!